Indeed, it’s increasingly likely that pub punters will be there for the food. In 2016, 23% of consumers said they had visited a pub in the past month because of the high quality of food on offer; while in 2017 this had risen to 30%. 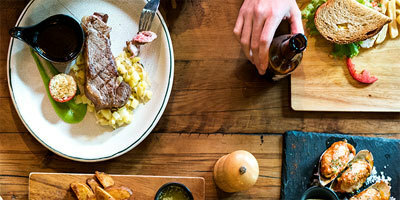 Currently, 69% of pub-goers say that one of the most important factors that would make them choose one pub over another is high-quality food, while one in six (16%) who visit pubs or bars to eat say they would go especially to try a new menu. Further showing that plates trump pints on pub-goers’ wish lists, a heady nine in 10 (89%) Brits say they typically visit a pub or bar to eat, compared to eight in 10 (79%) who go to drink in these venues. Overall, UK pub industry turnover grew by an estimated 8% between 2012 and 2016 to reach £23.5 billion. In 2016, alcoholic drinks made up half (50%) of UK pub industry turnover, compared to 31% brought in by catering. Looking into the battle for the UK’s favourite pub dish, it’s steak that tops the menu. One in five (20%) Brits say that grilled steak is their favourite pub dish, narrowly pipping roast dinners (19%), burgers (15%) and fish and chips (14%) to the top spot. Falling flat, however, just 3% say beef wellington or sausage and mash is their best of the bar meals respectively. What’s more, giving a new meaning to ‘getting pie-eyed’ at the pub, 5% say pie is their favourite pub dish. And it seems that many pub-goers aren’t afraid to splash the case on pub fayre, over three in five (63%) are prepared to pay over £10 for dinner at a pub (excluding drinks), with 18% happy to spend between £15-£19.99, 10% comfortable paying between £20-24.99 and 8% prepared to splash out over £25. While pub grub has not held the reputation of a fine dining destination in the past, today, Brits have high estimations of what they expect from public house cuisine. Almost half (45%) of pub-goers say that they would be put off ordering a particular dish at a pub or bar that wasn’t freshly made and one in 10 (10%) say that they wouldn’t like to order a dish that does not fit the image of a pub or bar. Looking to the future, over two thirds (69%) would be interested in seeing pub or bar dishes which are made with premium ingredients. Finally, it seems that pubs might be going back to their old-school ways. Two in three (65%) pub-goers say they would like more pubs to have quiet areas free from music and TV. Meanwhile, many still value table service; 61% of pub-goers say that table service makes an evening more special, while 75% say it’s important for waiting staff to be able to explain the menu.